On July 20th, 2017, RENTV held its Downtown San Francisco State of the Market Conference, in conjunction with leading real estate information provider CoStar. The event, held at CoStar’s spectacular auditorium/conference room on the 43rd floor of 101 California St, was a half-day affair featuring high-level panels covering office, retail, finance, and multifamily. There was also an energized and inspirational keynote presentation by Yat-Pang Au, Chief Executive Officer of Veritas Investments, the largest private apartment owner in the city of San Francisco. We will cover his discussion in detail in another article and we’ll post the video shortly on RENTV. The panelists started off by describing the deals and projects in which they have been involved in of late. Lumpkin led off by mentioning recent major leases he has closed within his firm’s 2.8 msf portfolio of existing office product that he represents within the city. This includes: the 1 msf 1455 Market Street, which is now fully leased; 525 Market Street, where his team signed a 180k sf lease with Amazon the week before the event along with a renewal with Wells Fargo for 142k sf, putting that building at 97% leased. And at Columbia Property Trust's 650 California, his team closed seven recent lease transactions totaling 195k sf. Lumpkin then shifted to his listings on new projects being developed, describing the exciting Shipyard project by FivePoint, which will eventually contain 4.3 msf of commercial space. The project benefited from the passing of Proposition O, a recent ballot initiative that exempt office development projects in Candlestick Point and Hunters Point from an annual 950k sf limit in the immediate area that had been imposed by voters through Proposition M.
Space at Shipyard will be delivered in three phases with initial occupancy taking place at the end of 2021. In addition, Lumpkin is working on Oceanwide Center, the 2.4 msf mixed-use project at First and Mission, which is being developed by Oceanwide, the big Chinese developer. It will contain a hotel, 1 msf of office space and 256 residences in two towers, with the signature tower at over 900 feet tall, making those units at the top the highest residences west of the Mississippi. Chris Lewis from Hudson Pacific Properties (HPP) then talked about his firm’s San Francisco portfolio, which includes 1455 Market Street, the 1 msf office building that Bank of America built in the 1970s for use as a data center. HPP did a major reposition of the asset and now it houses Uber along with Bank of America. The property has been 100% leased for a while, though some space is coming up. At another property, Rincon Center, Chris mentioned the lease with Google for 166k sf and, at 875 Howard Street, he just finished a lease for 35k sf, which now puts HPP at 100% leased for their buildings within the city. Jim Collins, the veteran San Francisco leasing exec at Shorenstein, noted that in the city of San Francisco his company still owns mostly legacy properties that were built by Walter Shorenstein, while over the years the company evolved into a private equity fund company now with 12 funds, which invest nationally and now own and operate a portfolio of 22 msf in many U.S. markets. In addition, he said that they see better returns from buying development or redevelopment opportunities, instead of fully leased properties. As for leasing opportunities that he is currently working on within their 3 msf San Francisco portfolio, he has a couple of full floors available at 50 California as well as three floors at 45 Fremont. One of Shorenstein's most notable recent San Francisco projects is the Twitter Building at 9th and Market, which was built in 1937 as the Furniture Exchange and Merchandise Mart. They came in and redid all the systems while completely renovating the building, and had it leased up in 24 months, after which they brought in equity partners. On the development side, the firm’s biggest current project is in Oakland, 601 City Center, which will contain 600k sf, of which 200k sf has been preleased to Blue Shield. The next two panelists, Adam Voelker from Tishman Speyer and Evan Schwimmer from The John Buck Company, benefit from having the uncommon perspective of developing both high-rise office buildings and multifamily projects – something not too many firms do. In San Francisco, Tishman Speyer has delivered over 750k sf of office space in two buildings as well as several new multifamily towers. On the multifamily side, in 2009, the company finished the 600-unit Infinity project and now they are in the final stages of selling out Lumina with another 650 units. Just across the street from there, they recently broke ground on Block One, with another 350 units. As for office space, they now have just under 3 msf in their San Francisco portfolio, along with two buildings in Silicon Valley where they are also looking to do a development deal. The John Buck Company is strongly rooted in Chicago, where they are a major player, and are relatively new to California. Yet, here in the Golden State, they are already under construction with a couple of major projects in San Francisco, including 75 Howard, a 20-story 110-unit ultra-luxury apartment high-rise on the Embarcadero, as well as Park Tower, a 45-story high-rise with 750k sf of office space on Block 5 of the Transbay District. They are just finishing the base now and transitioning to the steel construction, with topping out scheduled for January 2018. Their partner in the project is Met Life. Schwimmer noted that his company is also looking to expand their portfolio in the region. 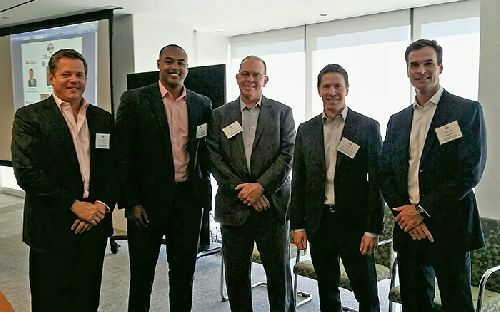 Probably the strongest takeaway from the office panel discussion was the overall continued strength of the San Francisco market, as each panelist reported about the various Class A buildings and deals they have been working on, with each experiencing strong demand and leasing prospects. Lumpkin provided some C&W statistics to back up this general assessment, reporting that they are tracking 5.3 msf worth of active tenant requirements, which is down a little from a year ago, but still very strong. The vacancy rate for the city as a whole is only 8.4%, which is up a little bit from a year ago, but still practically the tightest in the country. The latest figures point to $70/sf/yr average rents, $76/sf/yr rent averages in the Financial District, and some record territory deals going for around $83/sf/yr, according to C&W numbers. While the rise in rents is great for the owners' short-term bottom lines, the high rents and the often fierce competition with tech tenants for space has become a problem for bread and butter professional services companies like legal and accounting, and the FIRE tenants (financial, insurance and real estate). With the scarcity of large blocks, big tenants of all stripes have to think about requirements much longer in advance due to lack of space. For tenants that do not need to relocate, the problems with the incredible costs of redoing space create incentives for both the landlord and the tenant to renew. Another aspect affecting lease costs is the real estate tax portion of the operating expenses, which could be as low as $5/sf/yr on existing buildings or as high as $15/sf on new product, a cost that is passed along to the tenant. As for office building sales velocity, the panelists seem to feel that has slowed somewhat as many assets have already traded twice since the bottom of the market. So there is not as much of a market. However, in recent sales activity, 44 Montgomery, a 43-story high-rise built in 1966 as Wells Fargo Bank’s world headquarters, just traded, with Beacon buying it for about $800/sf. The panelists generally believe there is a second wind in the market for values to increase even more, an attitude fueled in great part by their optimism about the future strength and demand for San Francisco assets. To prove that point, they all said they were all looking to buy if they could find the right deal. As a potential seller, Schwimmer wouldn't comment as to how many offers they are already getting for Park Tower. But he did say that as it is still under construction, they will be extremely focused on leasing the building to the right type of tenants with a focus on credit, which should result in achieving a maximum value should a sale occur down the road. There is no doubt that with the huge challenge of getting into this market, the property will be in high demand from buyers. A later discussion topic was regarding potential opportunities for entrepreneurial groups to buy opportunistic smaller buildings that may be B or C Class, and then turning them into jewel boxes for one or two tenants of 50k sf or so, who want to be a bigger fish in their building. While the panelists agreed that opportunities like this do pop up on occasion, they noted that many groups are searching for these properties, and the costs of redoing space can make the economics very tricky. Collins noted that trying to time this type of value-add play and get in and out could be a fool’s errand, since one has to be well-prepared and well-funded to deal with the market at the time. Wrapping up the discussion with some thoughts on the future of the current crop of developments, panelists seemed to concur that Prop M is limiting supply, which is helping the projects now under construction. The panelists all agreed that these latest developments should all do well and enjoy strong leasing activity.